Hope you are having a wonderful day! Today is Design Time Challenge day at Creative Cutter Room. Our challenge was to create a love note box or treat box for Valentine’s Day. Be sure to visit CCR to see all of the great projects AND enter our challenge. This is the prize, the Sew Easy Tool and Fiber Card. This super cute little Purse – Note Card Holder. Here is another picture of the cards laid out in front. This is a shot of what the cards look like tucked away inside the little purse. I created the Purse from the Tags, Bags, Boxes and More Cricut Cartridge. I used some Basic Grey Patterned Paper and used the Fit to Page Function. It cut the purse out at 7”. The note cards are 3'” high by 2 15/16 wide. Just shy of 3 x 3. The width at the top of the purse is just a little too narrow to comfortably fit the 3x3 cards. I assembled the purse and added a pretty vintagey looking button. 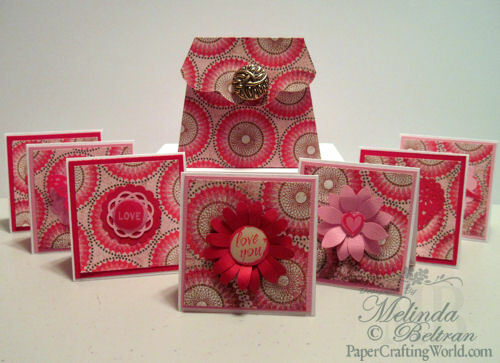 For the seven note cards, I used various punches to decorate the fronts. But you can always use your Cricut to decorate them any way you like. Here is the download for the FREE pdf scriptures. Be sure to head over to CCR and enter the challenge. Also, they still have their Tuesday challenge going on right now too! Oh so wonderful as usual! Thank you so much for sharing the scriptures. This is such a cute idea, Melin! Love the paper and that button is gorgeous!! Great gift idea!!! And this is so pretty!!!! Thanks for sharing the download of the scripture verses! The verse add to the cards make them even more special. Thanks for sharing them with us. This is super cute. Thanks for the great download. Thank you so much for sharing them with us today! It is an inspiring piece of art in so many ways!! Great work! What a great gift idea and useful for other things too, with other papers. Thanks for the inspiration and the freebie. These came out so adorable! Great papers! Great project! Thanks for sharing it. And thank you for the printable love scriptures. I love the LOrd, too, but am not good at thinking of ways to use scripture in my projects. Thanks for the inspiration! I love your cute purse and note cards! I really enjoy making 3 x 3 cards (2 15/16!) and I got the Bags, Tags, Boxes cartridge free with my gypsy, so now I'm going to try it out!